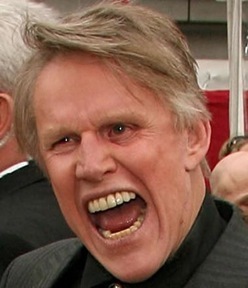 HP Computer warranties make as much sense as Gary Busey. My family, with help from Joe, got me a really nice computer last year. Joe helped get everything set up, including a 2 year warranty that would cover everything. Looking at the warranty, he was correct. This warranty covered just about everything that could happen to a computer, including demonic possession. About a month ago, something happened to the computer. I was playing Warcraft, when suddenly the screen went crazy and froze up. I restarted. Screen went crazy again. I restarted. The computer would turn on, but nothing would show up on the screen. After talking to tech support, I was able to get diagnostics to come up, but no Windows (or anything else). After receiving recovery discs (that did not work), I was told to send my computer off to HP. When I called to check on my order status last week, I was told that my computer would ship on the 24th. When I called today, I was told to grab my ankles and bite down on something. Basically, my computer was being held because they had to fix the motherboard...and it would cost over $400. "What was the point of the warranty?" I asked. "It is supposed to cover everything." "Whoever told you that was mistaken," the customer support rep told me. He then went through the list of things that would be covered. Apparently, it would have been much more beneficial for me to swim laps in a pool with the computer tied to my chest than for their motherboard to fry out inexplicably. So after paying the charge, I am actually thinking of taking my mom's advice and going to Clarke Howard's website. This isn't just ridiculous...it's RiDONKulous.